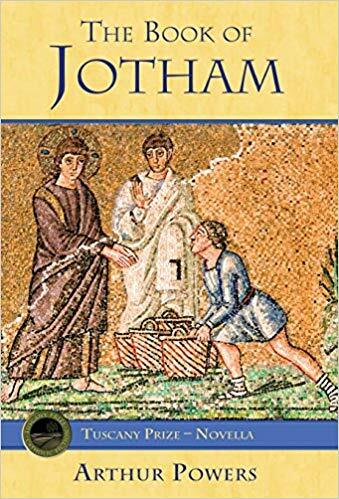 Jotham is a big, clumsy, mentally challenged mute who becomes a disciple following Jesus on his ministry. This novella is moving, beautifully written, and it is easy to see how it won the coveted Tuscany Prize. In the prologue, Powers says that this historical fiction story came to him in a prayer. Mentally challenged people had always bothered him because he identified himself and others as human according to their mental abilities. Back when I was a Protestant, I remember being bothered by this problem from a slightly Calvinistic angle. “How can a person be saved when he does not understand the gospel?” I used to wonder. Powers admits that he was praying over this problem in a church one day when the idea for Jotham came to him. In the book the other apostles wonder about these questions as well when they baptize Jotham, who is left confused and frightened by the experience of being suddenly dunked underwater three times by people he thinks of as friends. In response, Jesus asks, “What do you want? Would you feel better if Jotham sang praises to our Lord?” When the disciples falter, Jesus turns his eyes on Jotham, and for a brief moment, the muteness in him falls away, and Jotham sings out scripture. But when Jesus turns his eyes from him, Jotham’s muteness returns, and he shows no sign of understanding what happened other than a contented happiness. “Well?” Jesus asked after this miracle. “It is enough Rabbi. I don’t understand,” [said Judas]. “I thought it was Jotham who didn’t understand,” Jesus responds. In little ways like this, Powers challenges the reader to rethink how they see the mentally handicapped. When the apostles ask Jesus why He heals the blind but not Jotham, He says that there is nothing wrong with Jotham and it is not necessary to heal all the blind people of the world anyway. I do not know what condition Jotham has, but Powers does some unique things in his prose to convey the perspective of this man. The text is mostly in second person tense, (You get up; you walk down the road, etc.) and Powers never writes the words “Jotham thought.” Instead he sets scenes purely through description of sensations. Jotham may not know where he is going, but he knows the sun on his back and the road under his feet. He hears the words the others say around him and sees their faces but has little reaction toward them. The effect of this writing is powerful but also sometimes makes Jotham seem so empathic as to be a tad psychic. But then I have met more than one mentally handicapped person who can see through a charade and discern a person’s character faster than a college graduate. Jotham doesn’t have a character arc but he changes those around him, even the readers. One of the most moving things about this book is the presence of Judas. It is painful to see how much Judas is devoted to Jesus, how much the other apostles look up to him and how loyal he is until the very end of the book. Peter, Thomas, John, and all the apostles show up in one scene or another, but Judas is present in nearly every scene. His intelligence and eloquent speech stand in contrast to Jotham’s mute dullness. I was especially moved in the scene where the people abandon Jesus after He gives the “You cannot have eternal life unless you eat my flesh and drink my blood” speech. When our Lord turns hurt eyes to His disciples and asks them if they are going to leave Him too, I was reminded that Judas stood by the Lord even when it seemed the whole world would not. I often forget that Judas is even there when I read the Gospels but this book made me mourn for the man in a way I never have before. There is a quiet moment between Judas and Jotham that was particularly moving. Jotham overhears Peter tell Mary, “Judas is the cleverest of us,” and then finds himself looking into the water, wondering at the differences between him and Judas. This is to be expected but then it seems that Judas has the same worries on his heart. I highly recommend this book to anyone of any faith or secular worldview. I am not saying that this book will convince the secular reader of any Christian worldview but they will enjoy being brought into a greater appreciation and empathy with others who experience the world so differently. It will leave any reader mute with quiet wonder at the power of grace and love.